Cannabis use is illegal in Canada, yet 12% of the general population, 21% of youth aged 15-19 years, and 30% of young adults aged 20 to 24 years have reported past-year use. It is often viewed as having little effect on the person or society, but its use is associated with negative health outcomes, while criminal charges from its use could have social and economic consequences. The analysis of this use is limited, though, as the available data concerning the effects of cannabis on the person or society come from studies with specific target populations, limited sample size, and restricted timeframes, thereby making its interpretation challenging. Bill C-45, the Cannabis Act, will legalize and regulate access to cannabis in Canada. The intent of the legislation and regulation is to provide a public health framework that should reduce the likelihood of negative health outcomes and the potential effects resulting from criminalization. Bill C-46 proposes changes to the impaired driving laws with the purpose of more severely punishing those who drive while under the influence of drugs, including cannabis. Furthermore, the 2017 Federal Budget provided funding to support public education programs and surveillance activities related to cannabis use. 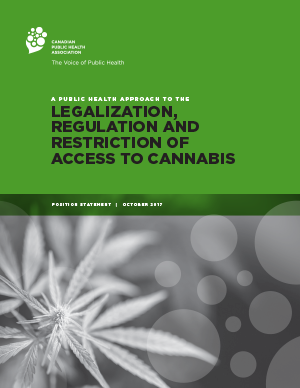 The Canadian Public Health Association (CPHA) commends the federal government for this important step in developing a public health approach to addressing cannabis use in Canada. The Association also recognizes that additional steps are required to develop and implement a public health perspective. Where necessary, adapt current substance use treatment programs to include cannabis. These approaches, at all levels of government, must be based on the best available information of what works, what is likely to work and what does not work. As such, CPHA also calls upon governments in Canada to support, develop and implement research programs, including cross-jurisdictional research, that address all aspects of cannabis use, with priorities developed with the Canadian Institutes of Health Research. Similarly, underpinning these initiatives is a requirement for an evaluation plan that provides timely assessment of what works and isn’t working so that adjustments can be made. Furthermore, CPHA calls on all provincial/territorial governments and Indigenous peoples’ governing organizations to collaborate closely on the development of all cannabis-related legislation, regulations and guidelines to minimize jurisdictional variations in approaches. Finally, CPHA calls on the Minister of Justice and Attorney General of Canada to introduce a moratorium on criminal prosecution related to possession of small quantities of cannabis for personal use, as a means of reducing the stigma associated with court proceedings and a potential criminal record for a product that will soon be legal. An additional consideration, once the legislation is implemented, is the potential effect of criminalization of youth who provide small quantities of cannabis to other youth for personal use. Care should be taken to apply the proposed rules concerning trafficking to reflect the severity of the crime. Public health is an approach to maintaining and improving the health of populations that is based on the principles of social justice, attention to human rights and equity, and evidence-informed policy and practice, and addresses the underlying determinants of health. It places health promotion (based on the Ottawa Charter for Health Promotion), health protection, population health surveillance, and the prevention of death, disease, injury and disability as the central tenets of all related initiatives. It also bases those initiatives on evidence of what works or shows promise of working. This type of approach is organized, comprehensive and multi-sectoral. It emphasizes pragmatic initiatives, and takes into consideration efficiency and sustainability. The Canadian Charter of Rights and Freedoms* and several United Nations conventions† provide the legal and social foundation on which to build a public health approach. Such an approach is driven by identifying and then acting on the determinants of health across the life course. It addresses physical, biological, psychological and social determinants, as well as social and health inequities. A public health approach recognizes that problematic substance use is often symptomatic of underlying psychological, social or health issues and inequities. As such, it includes the perspective of people who use illegal psychoactive substances or are affected by problematic use. Vital to this approach is the concept that those who work with people affected by, or on issues concerning, illegal psychoactive substances have the necessary education, training and skills to understand and respond to the needs of both people who use these substances and their families. This knowledge base includes understanding the relationship between substance use and physical and mental disorders. A more detailed description of a public health approach is presented in CPHA’s working paper entitled: Public Health - A Conceptual Framework, while our discussion paper on illegal psychoactive substances provides a public health perspective on this issue. CPHA has presented a description of the issues that should be addressed in any cannabis legislation and regulation. Many of the provisions contained in the draft legislation resonate with our proposals; however, there are topics that require further consideration and these are addressed below. It should also be noted that the American (US) states that have legalized cannabis have found it easier to start with more restrictive regulations and then ease them in the future, where appropriate. As such, careful consideration needs to be given to product regulations, specifically for smoked forms and edible cannabis products. CPHA recognizes the complex inter-relationships of federal, provincial, municipal and Indigenous governance authorities that exist concerning the regulation and sale of alcohol and tobacco, as well as the precedents and constitutional authorities that support those regimes. We also realize that these authorities need to be respected in structuring cannabis-related legislation and supporting regulations. This initiative, however, is a rare opportunity to develop a control system that respects Federal/Provincial/Territorial (FPT) and Indigenous governance rights while providing consistent pan-Canadian regulation of cannabis. CPHA believes that an FPT and Indigenous summary of issues and approaches for their management should be developed that would be applicable within the legal frameworks of the various jurisdictions. The draft federal legislation delineates areas of federal and provincial/territorial authority, however, further efforts should be undertaken to develop legislation, regulations and guidelines that minimize interprovincial and Indigenous variations in approaches. The Canadian Centre on Substance Use and Addiction identified the motivational factors for youth cannabis use as being: excitement, social pressure, coping, conformity, and increased understanding. In addition, youth generally receive conflicting messages from their peers, media, teachers and parents concerning the harms that may result from the consumption of cannabis products. As a result, youth generally view cannabis use as relatively harmless; this viewpoint must be considered when establishing related legislation and regulations. It should also be recognized that there is a near complete ban on tobacco advertising, and that alcohol products have restrictions on advertising. Such approaches should be used as examples for any control mechanisms developed for the marketing and advertising of cannabis products. Careful consideration needs to be given to taxation and pricing. The challenge will be both to determine the price elasticity for these newly-controlled products, and to establish a price point that reflects product cost, profit margins and a taxation rate that acts as a deterrent to sale, particularly for youth, while limiting the potential of maintaining an illegal market. Examples of such pricing can be found for the sale of both alcohol and tobacco. In each case, taxation is used as a deterrent to sales, however, arguments can be made that further increases in taxation rate for alcohol and tobacco are no longer effective at reducing sales. It should also be noted that, in the United States, Washington State’s current tax rate on cannabis products is 44%, and Denver, Colorado has a rate of 29%. A final consideration is that the marketplace for cannabis may see the development of a variety of products with varying levels of tetrahydrocannabinol (THC) with different levels of risk. As such, consideration should be given to establishing tax rates for such products based on their THC concentration. A step to implementing such an approach was taken when Royal Assent was provided for legislation designed to address the opioid crisis. Further steps, however, are required to support the public health goals of the proposed legislation. Such an approach must be developed, adequately funded and implemented with the support of all levels of government and those who use cannabis. THC concentration of 15% should be established. This level is based on THC levels in the current products, and the levels established by Colorado and Washington. wine and spirits (should the evidence support the designations), and information on where to access support services. The current retail sales model for medical cannabis in Canada uses an e-commerce approach, although storefront dispensaries have been established (illegally) in certain Canadian jurisdictions. The dispensary model is similar to the sales model in the United States. For example, in Washington State, retailers require a license and are limited to selling only cannabis products. The e-commerce model has numerous benefits in that consistent, high-quality information concerning products can be provided, and online ‘chat’ support can augment the information available online. It also eliminates the likelihood of placement of shops near areas where children congregate, and concerns regarding signage and advertising for such shops. CPHA recognizes the value of the current medical cannabis production, processing and distribution system. The anticipated increase in demand when retail sales are legalized, however, could exceed the capacity of the e-commerce sales and mail delivery system. In addition, the establishment of a storefront retail commercial system could lead to an increased variety of products, and purchasers may wish to have the freedom to view and purchase these products in person. A parallel can be seen between the controlled-access liquor commissions that existed through the mid-1970s in Canada compared to the current “liquor mart” approach. The public health concerns associated with broadening the sale of alcoholic beverages have been documented in CPHA’s 2011 position paper, while work has been undertaken to mitigate some of these concerns through the National Alcohol Strategy (Canadian Centre on Substance Use and Addiction). Further complicating this situation are the current provincial/territorial responsibilities to establish the means of sales for alcohol and tobacco in each province/territory. Maximizing market participation through open markets with effective regulation could be an additional approach to achieving the goal of eliminating the illicit trade in cannabis, and has been successful for the sale of alcohol. However, the challenges of establishing a free market approach, discussed elsewhere, have noted the limitations of a private sales approach. As such, an effective method may include the establishment of government-run, dedicated cannabis retail centres with trained staff who could enforce limitations on the sale of product, while providing other support information. However, given the concerns regarding co-use of cannabis and alcohol, the sale of these two products in the same location should be prohibited. The legalization of cannabis has the potential to dramatically limit the involvement of illegal activities. To date, however, there is a lack of conclusive evidence to support this contention in Washington and Colorado States. The likely reasons may include accessibility and selection of the legal product, and a lack of strict enforcement regimes targeted at the illicit market. It may be necessary for the Government of Canada to address product and access issues, while supporting consistent enforcement of renewed, stricter laws to apprehend those who operate outside the boundaries of the new legal system. Restrictions should be in place for cannabis consumption similar to those that have been developed for public and workplace consumption of tobacco products and alcohol. As previously noted, Canada’s Marijuana for Medical Purposes Regulations allow cannabis consumption for medical purposes with strict regulations on licensing, growing and distribution. These regulations are not encumbered by either restrictions on cannabis potency or age of consumption. However, the College of Family Physicians of Ontario does not recommend prescribing dried cannabis with a THC concentration above 9%, or prescribing cannabis to patients under the age of 25, unless all other conventional therapeutic options have been unsuccessful. Furthermore, these regulations do not allow for edibles or other forms of medical cannabis (other than cannabis oil) that have been demonstrated to have therapeutic efficacy in specific situations. It should be noted that results from the CCSA study tour of Colorado, a state which supports both a retail and medical cannabis regulatory system, noted the confusion and overlap resulting from maintaining the two systems. a physician to access specific cannabis-containing products, but physicians should take care to recommend the lowest-potency products to meet their patients’ needs. Similarly, CPHA recognizes that certain patients may require more potent forms of cannabis than would be legally available. Distribution of these specialized products should be restricted to those with medical requirements and be produced by authorized manufacturers. * Section 7 of the Canadian Charter of Rights and Freedoms provides for “…the right to life, liberty and security of the person and the right not to be deprived thereof except in accordance with the principles of fundamental justice” and was used as the legal argument for the Supreme Court decision concerning Insite, the supervised consumption facility in Vancouver, as under Canadian law addiction is considered an illness. † CPHA recognizes Canada’s obligations under the UN agreements to limit the sale and use of illegal drugs; however, we believe that our responsibilities under the following UN Agreements are of equal importance: the International Covenant on Civil and Political Rights; the International Covenant on Economic, Social and Cultural Rights; the Convention Against Torture and other Cruel, Inhuman and Degrading Treatment; the Declaration on the Rights of Indigenous Peoples; and the International Convention on the Protection and Promotion of the Rights and Dignity of Persons with Disabilities. The latter commitments should form the basis of the proposed regulatory regime.